Our Puppy Pre-schools are for vaccinated puppies aged from 15 weeks up to 30 weeks. Our classes only take up to a maximum of 5 puppies and are held weekly on Tuesday evenings at the practice. 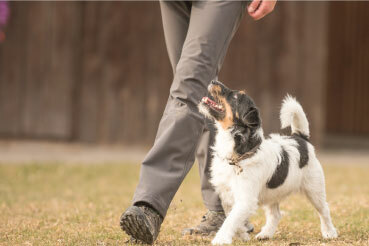 Your puppy will be learning basic commands (sit, drop etc) as well as walking on a leash and basic good behaviours to get you ready to introduce your puppy to the big world. Our Veterinary Nurse, Ana Sousa is your puppy pre-school trainer. Ana has experience in training puppies, caring for puppies and helping puppies transition into their new home and environment. Our Puppy Pre-School classes run weekly for 4 weeks. Please contact our reception on (02) 9344 8722 for next available Puppy Pre-School class dates. Please contact our reception on (02) 9344 8722 for class costs and to answer any queries you may have. Please contact our reception on (02) 9344 8722 to book your puppy in to Puppy PreSchool.